When it comes to Chicago Electric Welder Review, Chicago Electric makes a wide range of welders such as 90 AMP flux wire welder, 170 AMP MIG/Flux wire welder, inverter arc welders and many others. These welders come with great safety protection capability including thermal overload protection, current-fluctuation protection to provide smooth welding current. 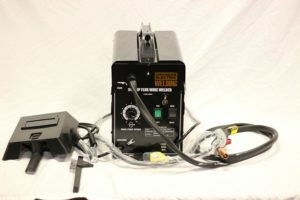 Chicago Electric Welding Systems 90 Amp Flux Wire Welder comes with variable speed wire control. It requires 120V power to run smoothly, and delivers 20 AMPs output to weld on a wide range of materials. The weldable materials are mild, low alloy steel, not suitable for aluminum or stainless steel. Further, it also comes with thermal overload protection with indicator light to protect your welding machine from overload and current fluctuation. Please make sure that Chicago Electric Welding Systems 90 Amp Flux Wire Welder doesn’t require gas or regulators. Chicago Electric 170 Amp MIG Or Flux Wire Welder is perfect for the newbie. The easy-to-operate welder comes with flux core and arc welding capabilities. You can add shielding gas with other necessary components MIG welding related works. As per Chicago Electric welder review, it features constant voltage, overload protection, and it comes with a welding cable with gun. You can say that it is the perfect welder for home projects. And it is durable enough that will run years after years. This Chicago Electric welder comes with four output settings, constant voltage and manual wire feed speed control. Further, it comes with six feet cable with gun, six feet ground cable with clamp. And it is a perfect welding machine to weld with 0.030 flux cored wire. It has 20-percent duty cycle at 110 AMPs, 60-percent duty cycle at 60 AMPs, and 100-percent duty cycle at 30 AMPs. Chicago Electric Inverter Arc Welder comes with DC output current allows soft fusion for impressive penetration. It has HOT START option that is good for easy start. You can easily change polarity between DCEN+ and DCEP-. The power switch comes with a light indicator that tells that the power is being supplied to the machine. Further, it comes with 5.5 feet welding cable with 2 angles electrode holder. 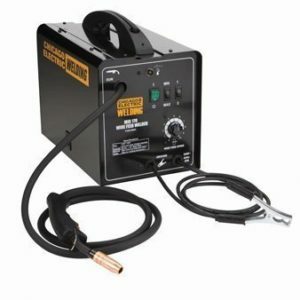 According to Chicago Electric welder review, this inverter welder comes with all the required accessories to start welding as soon as possible. This Chicago Electric welder features ARC Force that provides a 15-percent over current to stop sticking when the electrode enters the bath. Also, it has Anti-stick that lets you isolate the electrode very easily without reddening. Further, it has great welding current stability for a regular output. It requires 120V power, you can easily plug into your regular power outlet. When it comes to welding capacity, it delivers 10 to 80 AMPs welding current that is good to weld a wide range of metals.